*This is a great value for the best scouting service in the market. Just make the one-time payment with part of your first month’s profit (We offer a free trial for the first month) from your selling business, and you can use the scouting service with no more monthly fee! Please see the pricing info here. The $349 plan gives the user a license to use the live search scouting service for one device, for a lifetime. The $799 plan gives the user a license to use the database and live search scouting service for one device, for five years. The $1199 plan gives the user a license to use the database and live search scouting service for one device, for a lifetime. You would no longer need to pay any monthly or annual subscription fees. This license allows the user to use either our PDA scouting software or FBAScan scouting app on smartphones, one device only. This license does NOT include our other software programs or services. This license includes free scouting software upgrade throughout the life of the license term. This license is NON-refundable. We will not issue a partial or full refund at any time. Very important – This license requires the user to maintain an active Amazon professional seller account and register the Amazon MWS account with ASellerTool. Once registered, the license cannot be transferred to another Amazon seller account. If for whatever reason, the Amazon professional seller account becomes inactive or the MWS account is no longer registered with ASellerTool, then this license would become inactive. You can reactivate the license by reactivating your Amazon professional seller account and register the MWS account with ASellerTool again. This license cannot be transferred or sold to another party. This license can be transferred to another device under the same account holder. See here. This offer is limited to one device per Amazon Professional seller account, and it cannot be combined with other offers or discounts. This is a limited time offer. Take advantage of it now, as we may remove it at any time without prior notice. 1. Should I take this offer? 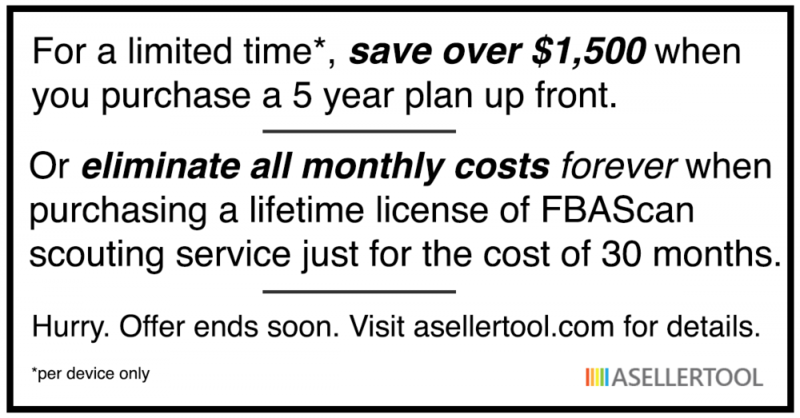 If you just started and made some money in the first month, you can sign up for a $349 lifetime FBAScan live search plan. By doing this, you can always choose to upgrade to lifetime FBAScan database + live search later after this promotion ends. You can also pay a database plan for a month or two, so you can use database + live search when you need it, and revert back to live search when you no longer need it. If you have already used our software for some time, made several hundred dollars in the first month and plan to sell on Amazon for another 2 years, the $799 plan will save you a significant amount of money. You pay once for 20 months ($40 if paid monthly), and you get 60 months of service. If you have already used our software for some time, made several hundred dollars in the first month and plan to sell on Amazon for another 3+ years, the $1,199 plan is an even better deal for you. You pay once for 30 months ($40 if paid monthly), and you do not need to pay anymore in the future. 2. Is there any catch or requirement? The only requirement to keep the license active is you must be an active Amazon professional seller, and register your MWS account with ASellerTool throughout the term of the license. Please refer to the description of terms #6 to #8 above. While this license will give you access to all scouting related features on one device, this license does NOT include our other software programs. 3. Can I transfer the license to another party? Once the license is activated with your payment and MWS registration, it’s linked to your Amazon professional seller account. It cannot be transferred or sold to any other party. 4. Can I get any refunds if I no longer need it? This offer is the best deal for any long term seller who wants to save money in the long run, so we do not offer any refund. 5. Can I transfer the license to a new phone or another device? Yes, as long as you are using the same Amazon professional seller account, you can always transfer your license to another device/phone. You simply follow the same device transfer policy. Please review here. 6. When will this promotion end? We may end this promotion anytime without prior notice after we have a certain number of sellers sign up. So if you find that our scouting service serves your business well and you plan to sell on Amazon for a long time, then you should take advantage of it immediately.